Welcome! We hope you enjoy your visit to our little part of the world. There are many delightful picnic spots around both villages, so bring a picnic lunch and enjoy your time here. We don't have any shops, cafes, permanent coffee shops, petrol stations, ATMs or medical services. The nearest are in Lithgow or Mt Victoria. We only have cafe's and BBQs selling food during the Autumn and Spring Festivals. We don't have any public telephones and mobile phone reception can be patchy to non-existent, depending on your phone company, your particular location in the villages and the weather! There are public toilets at Silva Plana (just as you enter Mt Wilson), the Fire Station, Founders Corner, Waterfall Reserve and Cathedral Reserve. Please only use the BBQ facilities at Cathedral Reserve. Lighting a BBQ at other places throughout the village presents a potential fire hazard. Please bring your own drinking water (the two villages do not have town water) we have to rely on tank water. 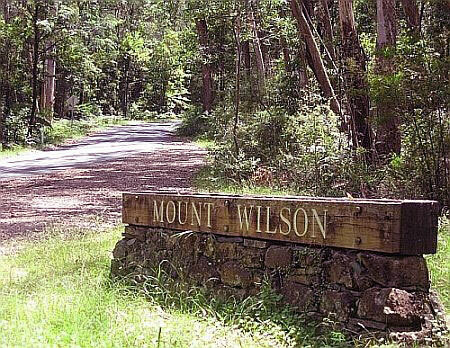 If this is the first time you have visited Mt Wilson, we suggest driving through the village to the end of The Avenue where there is a T intersection, and turn left towards Mt Irvine and drive about 1km to Cathedral Reserve. You will get a chance to quickly see some of the delights which make the village a treasure, and you will be able to find several places to park. There are many pleasant strolls in and around the village. However, if you are attempting a more ambitious walk in the surrounding national parks, please understand that weather conditions in the Blue Mountains are likely to change rapidly. All walkers should be aware of the possibility of heavy rain, fog and the likelihood of a rapid rise in water levels on all rivers and streams. Walkers and canyoners are strongly advised to take extra food and warm gear as it is possible to be stranded. No one should attempt these walks without an experienced person as part of the group. A rescue beacon, EPIRB or similar equipment is also strongly recommended. As noted above, mobile phones DO NOT work in most areas and should not be relied upon. The NSW Police Force and the NSW National Parks and Wildlife Service have produced a pdf 'Think before you trek' brochure (503 KB) which details much sensible advice about precautions to take before embarking on a walking trek. It includes essential telephone numbers and details for acquiring a loan Personal Locator Beacon.